One of my clients yesterday told me about this documentary currently available to see at SBS website. He's probably the best-known living painter, and one of my favourite artists. His diverse range of painting styles and subjects, from portraits to abstracts, never cease to inspire me. I particularly like his big, colourful abstract paintings. 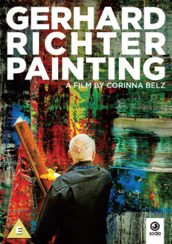 What I like about this film is, it solely focuses on his process of making abstract paintings. Unlike most of other art documentaries, where it's all about soundbites, the film's minimalistic approach feels like a fresh air. The camera simply follows him in the studio without not much talk between him and an interviewer. Probably that's how he likes it to be. He doesn't seem to be interested in any celebrity culture surrounding art scene. We can clearly see it when the camera follows his exhibition opening. A couple of months ago at NGV, I found one of his abstract paintings was on display. It was sensational. So beautiful and powerful that I spent a lot of time in front of it. This film offers us an opportunity to try to delve into his artistic mind.